For an uncertain, but plenty number of seasons, I have been a river dweller. Reluctant at first, because I am from another place far away, I took refuge here due to an injury to my right wing. There was a loud pop and then the pain. Aside from being quite rude and unkind, the act put me in this predicament, unable to fly. With a heavy heart and a broken part, I became a river dweller of the north. After many seasons of paddling the river up and down about a mile’s length, I found a brief path through the trees where a structure stood and featherless creatures offered me bread. I’d had it before someplace and liked it, so I accepted. They seemed friendly enough, but one must be wary, even though hungry. I’m not certain why, but they began to refer to me as Oscar. Back and forth I swam, admitting to only myself, I was lonely. My feathered friends had stayed with me at first, but then they flew and surely wished that I might follow. Time after time, when cold winds came, I was left to find a place to sleep among the briers and bramble, where four-legged creatures would need to struggle in reaching me. Then a great surprise came. Some might have thought I would live helplessly and hopelessly alone, until a large and handsome flyer came to the river and invited me to become his partner. I was proud and delighted as he defended me against rude creatures of my own type and others. It was quite a delightful stance in life. Together, he and I guarded over our two young ones and took great pleasure in watching them grow. They learned to navigate the water and to avoid the large turtles, and my strong one taught them to spread their wings. Unlike their mother, they soared above the tree tops, looking down at me. It was most troublesome to be sad and happy at the same time, but when I saw my young ones fly, I managed the two conflicting feelings. It worried me that I could never go where they go. What if they didn’t come back, because like me, they couldn’t? Before too long, a fear came forth – my graceful daughter disappeared after one of their flights. When I fussed over her absence and asked where she was, my partner and my son looked around them in disbelief and told me they had no idea why she didn’t come home with them. How like males to lose something so important. I searched for her every day, but nothing. I do not know what became of her. That first year of our son’s birth, they flew often and I thought they might go. But with winter’s chill and white flakes falling, they looked at me and stayed. One day when it was particularly cold and ice hung from my broken wing, a strange thing occurred. The unfeathered creatures called to us and offered bread to us in a place surrounded with what I’ve heard them call a fence. We walked in innocent enough, munching on bread, and then the fence closed in behind us. We looked up, but there was a fence there too. And in a corner of that large area, there was a structure, and there we were, of course, perturbed and frightened. We didn’t know what to make of it. Fen, that’s who locked us in, seemed quite nice, but what did he really want of us? That’s what we wondered. There had to be something, we just hoped it wouldn’t cause any of us harm. We later understood when he spoke with Miff, (who seemed to be his partner), that we were to be fed and given a place inside the structure where there was hay and grain. We would live there for the cold time. At first we were angry and frustrated being caged and cornered, but then we liked the warmth and the food. Quite often, Chish, who seemed to be their female gosling, fed us and helped to clean out our warm area. Not that it was all that soiled, we were very clean and neat after all. Now, when trees began to bud with hopes for new life, and the river was no longer hard, Fen, Miff and Chish came to us and did a very peculiar thing. They opened our door and set us free. We were astounded. We wanted to go off and be free, but at the same time, we looked at one another and wondered if the featherless had tired of us, or if they didn’t like us anymore. But we went along, bathed gloriously at the river’s edge, and delighted in being once again able to glide through the slice of water surrounded on each side by familiar and gigantic trees. It was wonderful, gleeful, invigorating. The first night, I will admit that I felt cold and longed for the warmth and security of the warm structure with the large bowl of golden corn, and I was alerted to the woodland sounds. I didn’t sleep well, but after a few nights, I adjusted and after all, I’d been out on the river for years. We would, I thought, stay together and be fine. It grew warm at last. Our male gosling explored at the urging of my partner, and so he and I wandered about together up and down the river. I had some eggs in a nest and we were hopeful that they would remain protected until our family might once again increase. It is very joyful to see the little life emerge from the shell. It is miraculous, in fact. But as fate would declare, rains came and the river flooded taking with it to the sea, our eggs. When autumn came, my partner flew with our gosling. I stood at the river’s bank and cried to them. After many rounds over the tree-tops, they came back and I was at ease. But then the day came when they flew and they didn’t return. I stood at the river’s edge day after day, crying out and receiving no reply. They had gone. They had urged me to try, but I could not properly explain to them that I could not go, though my heart certainly did. It was a terrible time. And then it happened again. 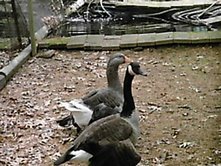 With ice hanging on my wing, weighting it down, Chish, the featherless gosling, came to me with bread and then scooped me up like an old log and took me inside the fence and to the structure. It wasn’t as nice as when I’d shared it with my loved ones, but the warmth was pleasant and the grain was good. I settled down and decided that this was as it seemed, a time again to be lonely. Out in the fenced area, I noticed that when the white stuff had gone away, the trees were beginning to green up again and birds were singing. I looked out toward the river and Miff watched me. I stood there a long time, honking a bit, and then she called to me and opened the gate. I was very surprised, but I walked toward it and out to the path and the river. This was certainly a sweet turning of events. I splashed and swam, loving the freedom, but every now and then, I looked wistfully up stream to see if anyone I loved was there. While I was sleeping in the sun one day, my son came down the river and sat next to me. When I turned my neck and opened my eyes, I thought I was dreaming. He was there, but my partner was not. We do not know what became of him. 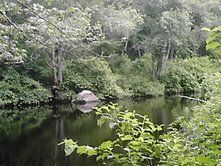 All of the warm weather, my son and I went swimming together, tasting the sweet grass of the water’s edge and enjoyed the bread from our friends. It was acceptably nice. At the beginning of autumn, my son flew often, always coming back to me, until the day he didn’t. I cried out for him, I fretted as I swam, looking side to side for him, I looked to the sky for him, but nothing. The cold came, and so did Fen, Miff and Chish, once again inviting me to spend winter in what they called the barn. This time, I was in for a true surprise. There were geese in there of varying colors. Three were gray with golden beaks and feet. One was white and one was brown, and they had golden beaks and feet as well. They were odd. They bickered with me a bit, but once we came to know one another, it was fine. I rather came to like one of the grays. It went on like that for season upon season. I was aware of being on that river for at least eighteen hardenings of the water. I knew I had to be about twenty or so lengths of full seasons’ time. I guess that made me elderly. The last time I was offered the chance to pass through the gate and to the river’s pathway, I hesitated and looked back at my new brothers and sisters in their funny outfits. They could be chatty, but they were company, and the new pool in the area was quite ample and nice for a relaxing bath and swim. And then my gray friend looked at me with worry on his face and I turned, the decision made. I would stay. The time I have in front of me will be spent with companions and in comfort, but what I did not declare before is, that after two or three years of deciding to stay with my friends, my son came back. He was ill. Fen picked him up and brought him to where I could sit with him. They gave him medicine and food, but to no avail. He died and I was sad. My friends came to mourn the lifeless body. Fen made a bed for him, soft inside with old blankets, and they committed him to a hole in the ground. I sat there for one whole day until they urged me inside the barn for the night. I have learned now, that there are some things we cannot earn nor control. I have also learned that having friends is a very good thing. I am here, lucky to have ended up on a river where creatures cared enough to give me a home, where dark of night and howling winds will not find us, and the chance to know and love a family of my own and a family with coats of many colors. Oscar and her friend, Summer and the river that Oscar used to dwell at.